A.B., F.I.C.S., Member I.C.A.N., President A.B.I.S. Robert C. Olney, M.D. has been engaged in private practice of general surgery for many years, and is a member of the International College of Surgeons. He has also been president of the American Blood Irradiation Society for many years. He has been active in the fight against fluoridation of public water supply by spreading information on the harmful effects of fluoridation. 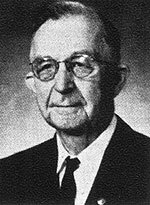 Beginning in 1950 he promoted and built Providence Hospital, Lincoln, Nebraska, a 125 bed general hospital owned by a non-profit corporation, the Olney Foundation. This hospital was developed particularly to preserve the American way of medical practice and the "enterprise of free men" in science and medicine. Recently he has added to the broad program of the treatment of cancer the oxidation catalysts, which are valuable additions to the program of treatment of cancer and other diseases. This presentation deals with the prevention and treatment of "blocked oxidation" which we consider the prime cause of malignant, viral, bacterial, and allergic diseases. With our present knowledge it should be possible to prevent and wipe out cancer and serious infectious diseases. We are in an era of destructive therapy, powerful poisonous insecticides, fluoride poisoning and "embalmed foods." This is an era of ignoring the principles of healthful living and then attempting to cure everything by taking an array of pills. We believe that the so-called "accepted" methods of treating cancer are no more successful today than they were 40 years ago. We are entering on an era of prevention and simple effective treatment of malignant, viral, bacterial, and allergic diseases. Blocking of,(1) or injury to the vital oxidation process (respiration) of the living cells by oxygen deficiency or various toxic substances we find to be the most important cause of malignant, viral, bacterial, and allergic diseases. Effective prevention and treatment of these diseases depends upon the restoration and maintenance of the normal oxidation process. Knowing and eliminating the oxygen deficiency and these toxic substances is of prime importance, but once the blocking process or injury has become established effective means must be taken to reverse the process and restore normal oxidation. The condition will not return to normal simply by elimination of the cause. In malignant disease, (1, 2) when the oxidation process is blocked, energy is produced by fermentation and viruses grow profusely in this condition. For many years Dr. William F. Koch(1) and Otto Warburg (2, 3) have claimed that blocking of, or impairment of oxidation in the enzymes and cells allows fermentation of sugar and that fermentation in these enzymes and cells is the PRIME CAUSE OF CANCER. Koch (1) has also proved that blocked oxidation in micro-organisms causes them to be pathogenic and parasitic, and that when this condition is corrected these organisms become non-pathogenic, non-parasitic, and non-virulent. Our clinical studies show that intravenous Ultraviolet effectively increases the blood oxygen to normal or near normal in most cases. In the treatment of these cases the following are very important: 1. Intravenous Ultraviolet rapidly increases the oxygen absorption of the patient bringing the blood oxygen up to normal. The powerful oxidation catalyst stimulates the use of this increased oxygen or the patient's oxygen at any level to restore the normal oxidation process (cell respiration). 2. The diet of these patients is extremely important, using foods grown with natural fertilizers and without poisonous fertilizers and insecticides, and eating much of it raw. Since so many of these patients are deficient in important trace minerals such as magnesium and zinc it is important to see that these patients are supplied with sufficient trace minerals in chelated form so that they are readily absorbed. 3. Since much of the toxic substances producing these diseases comes from the colon we use colonic irrigations for thoroughly cleansing the colon of these substances. Since the normal pH (of fresh stool) of the colon must be properly maintained this is done with every means to promote the normal physiology of the colon. 4. All factors for the most healthful condition of each patient are carefully considered and treated. Pasteur was the first to discover the oxidation process or respiration in the cells and enzymes. Koch,(1) Warburg,(2) and others have firmly established the fact that oxygen deficiency and certain toxic substances block the oxidation process, and that in this condition energy is then produced by fermentation instead of oxidation. This is the pathological basis for malignant, viral, bacterial, and allergic diseases. The pathogenicity,(1) virilance and paracitism of micro-organisms is due to the same blocking of oxidation in these organisms. When normal oxidation is established in these organisms they lose their pathogenicity, virilance, and paracitism. Prevention of the devastating effects of these diseases is one of the principle goals of this work and study. Now that we know these causes of these diseases, it is imperative that we put forth every effort to prevent them. Treatment of all of these conditions in the earliest possible stages is also our goal, when these patients have not been subjected to destructive forces and treatments which are so generally used in the treatment of these diseases. I. On January 17, 1969, Miss D.P., 38 years old, white female, was admitted to Providence Hospital. Past History: Eleven years ago a melanoma was removed from the right upper arm. August 1968 subcutaneous tumor mass appeared on the upper left chest just below the clavicle. Excision and biopsy of this revealed malignant melanoma. Following this she developed a tumor on the right chest at the same level, tumor in the right axilla, abdomen began to become very large, patient had marked difficulty in breathing, and constant cough. There was gradual and painful swelling of the right thigh (all at another medical center). Present Illness: On entering the hospital patient was in critical condition with marked difficulty in breathing, constant cough, cyanosis, abdomen was very large and pendulous containing a large amount of fluid in which there were large tumor masses palpable throughout the abdomen, especially the entire lower abdomen and lower right quadrant. Extremities: The right thigh from the knee to the hip was very swollen and painful, about twice normal size. Treatment: Patient was immediately given ultraviolet blood irradiation (UBI) to overcome hypoxemia, the oxidation catalyst (Koch Glyoxylide) intermuscularly, ultra mycro-wave therapy throughout the body, diet consisting of raw vegetables and fruits eliminating all meats and fluorides, colonic irrigations to remove the toxic material from the colon, and large doses of trace minerals especially magnesium and zinc with natural vitamin C and natural vitamin E in addition to other natural vitamin supplements. UBI treatments given on January 17, 20, 24, and once a week following this. Koch Glyoxylide given on January 17, February 20, March 21, June 2, and July 17. Mycro-wave given on January 17, 27, February 3, 6, 12, 19, 26, and once a week following this. Within three weeks the mass in the right axilla had disappeared as well as the tumor of the right chest wall, and the abdomen was becoming definitely smaller and the tumor masses much smaller. At the end of six weeks of this treatment patient had no difficulty in breathing, the right thigh was normal size and no pain, the abdomen had returned to normal size with no fluid, and the tumor masses were practically gone with only very small evidence of tumor in the lower abdomen. Patient up and about in a normal manner except for some weakness following her long illness. This patient will remain under treatment in the hospital for another 2 or 3 weeks when she will be discharged to go to her home in Utah with instructions to return in approximately 3 months for examination and further treatment for the prevention of further development of malignant melonoma. This type of case will need observation over a period of several years to be sure as possible of success. This case illustrates the very early effective results of treatment of the whole program that we are now using for the treatment of all malignancy. This treatment is based upon the evidence (4) that cancer is due to hypoxemia and blocking of oxidation with the development of fermentation of sugars which causes the cancerous growth. It has been shown that all cancers have one common factor, and that is, fermentation of sugar in the enzymes and cells, replacing normal oxidation. Reversal of this process back to normal oxidation is all important. II. Mrs. A.F., age 64, white female, entered hospital on April 21, 1953 with a rapidly developing carcinoma of the left breast. A few years before this she had had cancer of the right breast with a radical mastectomy followed by x-ray therapy. On this occasion mastectomy with removal of axillary lymph glands was performed, but not a radical mastectomy. It was found that the cancer was penetrating the chest wall and into the lung. Post-operative therapy consisted of x-ray therapy, but principally the program of stimulating the oxygen content and the use of minerals, particularly magnesium and zinc. At first the UBI treatments were given at weekly intervals and after three months they were given at monthly intervals and this continued on for five years. She continued to take the zinc and magnesium supplement and other general vitamin supplements. Within a few months there was no evidence of malignancy in the x-ray of the lung. This patient is now living and well and has had no evidence of recurrence of her malignancy. III. Mrs. A.R., age 60, white female, entered the hospital June 22, 1960 with a large tender mass in the left abdomen which was thought to be a perinephritic abscess. Upon operation it was found that patient had a large carcinoma of the splenic flexure of the colon which had ruptured into the abdominal cavity. There were melostatic nodules beyond the primary growth. A Miculitz type operation was performed and in due time closed. Following surgery patient was placed on an intensive program of ultraviolet blood irradiation, given four in the first week and one each week thereafter for several months. She was also given zinc and magnesium in adequate amounts with other vitamin and supplements. Patient made a very excellent recovery from the surgery and is living today. She kept up with the blood irradiation treatment once a month for 5 years and also the supplement therapy. IV. Mrs. C.B., age 55, white female, entered the hospital on January 4, 1954 with a nodular tumor of the thyroid. At operation it was determined she had an adeno-carcinoma and sub-total thyroidectomy was performed leaving very little thyroid tissue. Following her surgery she was given UBI treatments, four in the first week and one each week, following this together with adequate magnesium and zinc therapy. This treatment was continued once a month for 5 years. Patient is still living and well and has had no recurrence of her carcinoma. V. On April 30, 1969 Mrs. I.W., white female, 50 years of age entered Providence Hospital for treatment of a large tumor of the uterus considered to be carcinoma. On entering Providence Hospital, examination revealed a large tumor of the uterus and pelvis, specifically carcinoma. She was given ultraviolet blood irradiation on May 1, 2, 6, 14 and once a week following this. She was given Koch Glyoxylide on May 1, 6, 26, June 6, 16, she was given mycro-wave treatments on May 1, 6, 14, 19, 29, June 4, 9, and 30th. Along with this she was given the diet of raw vegetables and fruits together with adequate amount of zinc, magnesium, vitamin C, vitamin E, vitamin B6. By June 24th examination revealed a marked reduction in the size of the tumor with only slight discharge from it and it was felt that it was possible to remove the tumor surgically. Hysterectomy was performed on June 26, 1969 by Richard C. Olney, M.D. and the entire uterus including the cervix removed and the remaining right falopian tube. Pathological examination of the specimen removed failed to reveal any viable cancer tissue in the cervix or uterus. Patient has made an uneventful recovery from surgery and is continuing on with a vigorous program of treatment to assure as much as possible no recurrence of her malignancy. Hypoxemia is a common and serious factor in so many diseases and surgical procedures. Correction of this and bringing the oxygen saturation of these patients to normal or near normal is vitally important in the treatment of these diseases and the success of serious surgical procedures. For this study twenty-three patients were selected at random regardless of the diagnosis in which there was clinical evidence of hypoxemia. Patients were selected in which there was no known condition which would interfere with or change the outcome of these studies. Before the first treatment of intravenous ultraviolet 5 cc of venous blood was removed and immediately taken to the American Optical Oximeter and the oxygen saturation was determined prior to the treatment. In this way the oxygen saturation was compared with the day previously, and the previous determinations, for the changes which could take place following the intravenous ultraviolet therapy. Normal oxygen saturation on the American Optical Oximeter is 100% for arterial and 72% for venous blood. Mr. L.H. Middle-aged man with lymphatic leukemia. Mr. C.G. Metastatic carcinoma of the lung. Mrs. E.H. Hysterectomy for uterine fibroid. Miss D.W. Laboratory technician. Apparent good health, but heavy smoker. Mr. V.B. Acute severe respiratory infection. Mr. C.T. Severe diabetic with cerebral vascular accident. Mrs. B.S. Acute mastoiditis and upper respiratory infection. Mrs. H.M. Acute congestive heart failure. Mr. E.D. Asthma with acute myocarditis. Mr. A.V. Extensive malignancy of the ear and side of the head. Mr. P.Z. Severe Diverticulosis of the colon, myocarditis and acute respiratory infection. Mr. C.C. Patient in critical condition with intestinal obstruction. Acute respiratory infection. Mr. R.D. Complete acute occlusion of the femoral artery at the femoral region with impending gangrene of the leg. Miss A.W. Operated on for cholecystectomy and appendectomy. Miss N.S. Coronary insufficiency. Respiratory infection. Mr. W.H. Acute cerebral vascular accident with severe acute otitis media and mastoiditis. Mr. A.C. Myocarditis, Acute respiratory infection. Carcinoma of the prostate. Mr. R. Stricture of the lower esophagus with almost complete closure of the esophagus and marked dilation. Mr. B.S. Pericarditis, Cholecystitis and Pyelonephritis. Mrs. R.B. Thrombophlebitis and Cholecystitis. Mrs. P. General carcinomatosis of pelvis from CA of uterus and heavy cobalt treatments. It is important to emphasize that in so many pathological conditions there is a very marked hypoxemia and that this is a very important factor in the diseased condition. Whether it is an etiological factor or a result is not important. It is important, however, that the blood oxygen saturation is returned to normal as rapidly as possible, in the treatment of these patients or in the performing of extensive surgical procedures, as a matter of giving these patients one of the most important factors in their defense mechanism and resistance. Hypoxemia and blocked oxidation followed by fermentation of sugar in the enzymes and cells we consider to be the prime factor in malignant, viral, bacterial and allergic diseases. A program of prevention and treatment of this condition is presented which has proved in the past, and is proving at this time to be very effective, in correcting the pathological physiology which has taken place and returning normal oxidation to the enzymes and cells for the recovery of these patients. (1) Koch, William F., M.D. : The Survival in Neoplastic and Viral Diseases. Vanderkloot Press, Detroit, Michigan, 1955-1958. (2) Warburg, Dr. Otto, Director Max Tlanck-Institute for Cell Physiology, Berlin-Dahlem (Nobel Prize 1931); "On the origin of cancer cells," Science Magazine, Feb. 24, 1956, Volume 123, #3191. (3) Warburg, Dr. Otto: "Revised lecture at the meeting of Nobel Laurets," June 30, 1966, Landau, Lake Constance, Germany. (4) Burk, Dean, National Cancer Institute, Bethesda, Maryland: "The Prime cause and prevention of Cancer," Konrad Trietsch, Wurzburg, Germany, 1967; English edition by Dean Burk. (5) Olney, Robert C., M.D. and contributors: "Treatment of Viral Hepatitis with Ultraviolet Blood Irradiation," Am. J. of Surg., Sept. 1955. (6) Miley, George, M.D. : "The Ultraviolet Irradiation of Auto-transfused Blood: Studies in Oxygen Absorption Valves," Am. J.M.SC. 197:873, 1939. (7) Olney, Robert C., M.D. : "Ultraviolet Blood Irradiation in Biliary Disease." American Journal of Surgery, August, 1946. (8) Olney, Robert C., M.D. : "Ultraviolet Blood Irradiation Treatment of Pelvic Cellulitis." American Journal of Surgery, Oct. 1947. (9) Olney, Robert C., M.D. : "Role of Ultraviolet Blood Irradiation Therapy, Not Technic, in Surgery." International College of Surgeons Journal, 1949.